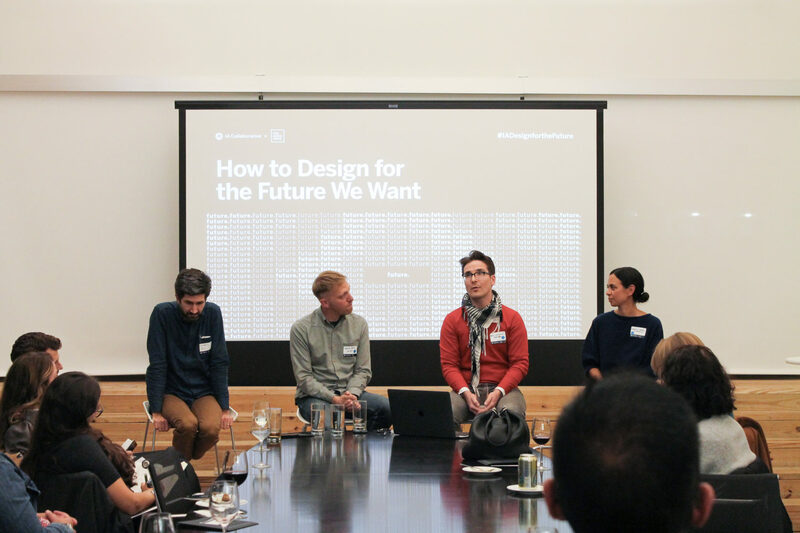 On November 1st, IA Collaborative hosted Chicago Design Week panel How to Design for the Future We Want. Our panelists included Charles Adler, Co-founder of Kickstarter and Founder of Lost Arts, Rebecca Gimenez, Group Design Director at IA Collaborative, Maciej Kaczyński, Architect at Studio Gang, and Michael Neault, Executive Creative Director, Experience Design at the Art Institute of Chicago. The panel was moderated by Matt Alverson, Partner at IA Collaborative. The theme for Chicago Design Week focused on examining the evolving definitions, responsibilities, and societal expectations shaping the designer today. The team at IA Collaborative explored this theme through the lens of design’s influence on creating the future, and more specifically, the future we want. In exploring the role designers play, the group acknowledged that the expectation of what designers can – and should – accomplish is changing. Design has evolved into a strategic advantage for business, organizations, and society, and designers are now empowered with the mindset and skillset to create not only the physical and digital environments we interact with daily, but also the innovation that shapes the future of the world. Design, when leveraged strategically, has led to some of the world’s most innovative and disruptive organizations. As an example, Gimenez pointed out that she often works with clients to design and launch their next competitor; a process that involves prototyping business models, brands, user experiences, and more. Kaczyński explained the new expectation of architects to responsibly design structures with purpose and endurance in mind; and Neault described how the Art Institute of Chicago is evolving its approach to audience engagement by considering both its physical and digital spaces. As for Adler, he believes designers have a unique opportunity to construct the future, but in order to do so, they need to control the economics of a project. Thus, he believes those designers that also position themselves as entrepreneurs can truly design the future. As designers, we have the right to create the future we want. The panelists were asked how they think technology has changed and will continue to shape the future. Instead of focusing on specific technological advancements, the group came to the consensus that technology has created a unique challenge for designers: how can design create meaningful, impactful, and enduring experiences? With so many interfaces and inputs offering up endless amounts of information, attention spans are spread thin, challenging designers to consider how their experiences can both stand out and add value. Attention has become a form of currency. But good design is about more than capturing eyes…it’s about creating experiences that invite and strengthen attentions spans to endure over time. Designers must not only create visually compelling and high-quality products that capture attention, but must also consider how those experiences will continually engage their audiences over time. Neault explained that his role is to create a space and experience designed to be revisited and explored over and over again. He challenged the audience to consider how design can help users focus their attention on the present by providing layered, meaningful experiences that leave a lasting impact. How do you design a layered experience, so whether it’s your first time or your 20th time, you are learning and being inspired? The group also acknowledged that because design has such a significant impact on society, designers should be responsible for considering the implications of their creations. For example, Kaczyński described how using context to make architectural decisions around material selection is a must in designing for the future. We can make homes out of paper that will last a day. We can make homes of brick that will last decades. We have to ask what purpose a structure will serve and choose materials in the context of that purpose. The panel recognized that there are future consequences to the design choices made today, whether it’s a building made with material that won’t biodegrade 50 years from now, or designing a community platform that ends up easily hacked for ill intent. While some consequences are not entirely predictable, it’s important for designers to deeply consider the potential outcomes of their actions and creations. What’s the consequence of what I’m going to design in 5 years’ time when my vision becomes reality? Today, the expectation of designers is changing as rapidly as technological and societal advances. Our esteemed panelists explored what designing the future really means in the context of not only their expertise, but also through the lens of the broader discipline of design. When leveraged strategically, design becomes a catalyst for innovation in business and society. Designers have an innate power – and a unique opportunity – to create the future we want. A special thank you to our panelists, Chicago Design Week, and attendees for joining us for the panel, How to Design for the Future We Want. To learn more about IA Collaborative, explore our website and sign up for our newsletter.